Going from Spilt/Second to the very reserved Live Arcade puzzle-platformer Limbo was a little jarring, but oddly, it was the smaller game that captured my imagination much more the very flashy arcade racer. 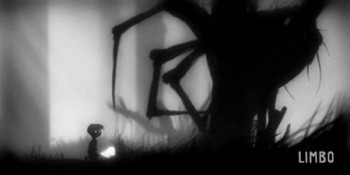 Limbo is something of a labor of love for Play Dead Games; the original concept for the game was dreamt up six years ago by studio head Arnt Jensen. Concept media put together three years ago piqued peoples' interest, and the game began to come together around 18 months ago. The game is very simply gorgeous, with an incredibly simple, but striking visual style. The entire world is rendered in silhouette, with shade and focus used to suggest depth. You make your way through forests and caves, solving puzzles as you go. The puzzles are incredibly elegant, and the whole game has been designed with accessibility and simplicity in mind. In one puzzle, for example, you need to climb a rope tied to a tree to get to a higher platform, but the rope has an animal carcass tied to it as part of a trap and adding your weight to it means that it hangs too low to reach the ledge. Clearly you need to lighten the load, and the way you do that is by dragging a bear trap under the wrap so that it goes off when you jump on the rope, slicing off a portion of the carcass, and reducing the load enough to let you jump to the platform. Limbo takes a more realistic approach to platforming - there's no changing directions mid-jump and no jumping ten times your own height - and the ability to drag parts of the scenery, such as crates or boxes adds another element to both the puzzle and the platforming gameplay. You very quickly get used to the controls though, and judging what jumps you can and can't make becomes intuition almost instantly. Limbo is also notable for having no music, instead relying on ambient sounds to evoke atmosphere in a more subtle way than most games, with string sections at tense moments nowhere to be seen; well, nowhere to be heard anyway. I got a chance to talk to Mads Wibroe, the producer for Limbo, and he said that it was very important to the team that Play Dead Games retained control of the IP. Despite working with Microsoft to bring the game to Live Arcade - citing piracy as the reason for the choice of platform - the game is entirely self funded, which gave Play Dead the ability to develop the game as they wanted. What Play Dead has created is a game with ambiguity and vagueness built in. The game has very minimal story, instead just having the tagline "unsure of his sister's fate, a boy enters the unknown". Wibroe says that the development team has deliberately kept information to a minimum, as it wants players to decide for themselves exactly what's going on. Limbo doesn't have a release date just yet, but be sure that when it does, I'll tell you about it. You can find out more about the game - although not much more - by visiting the official Limbo website.